Yep, they are calling it 'honey mustard vinyl.' That's great and it actually looks like that color, so even better. This split 7" features a band I've become quite familiar with over the years coupled with a band I'd not heard of previously. This is the third time I've written about Songs For Snakes and their melodic punk by old punks for old punks. Combine the aggressiveness of Bivouac era Jawbreaker with huge guitar tones that remind me a lot of Fig Dish and mix that potent cocktail with gravely vocals. If that sounds like exactly the sort of thing you'd expect me to listen to, you're correct. Very much my cup of tea. They also have a new full length out, so I'll be writing up that soon as well. On the flip side is If It Kills you. 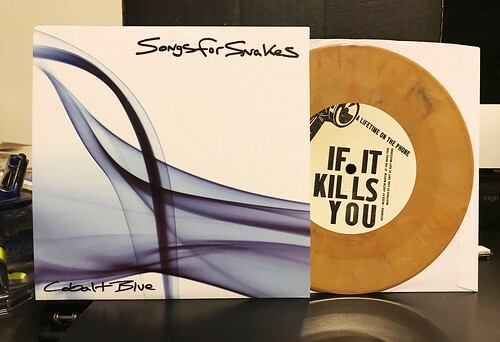 I haven't listened to them before playing their song on this 7", and while I can't say I like them as much as Songs For Snakes, it sure compliments them with their own very 90s sounding song. If It Kills You, to me, is harkening back to a slightly noisier strain of 90s punk rock. A little bit of the more chaotic moments of Seaweed mixed in with some of the poppier aspects of the AmRep catalog. The vocals have that static-y telephone effect on them, kind of how Rocket From The Crypt used it in "The Paste That You Love," though not quite as blown out as Rocket. I say all the time how the split 7" is one of my favorite ways to listen to music. There's something kind of timeless about the experience to me and I wish they were more common today than they are.